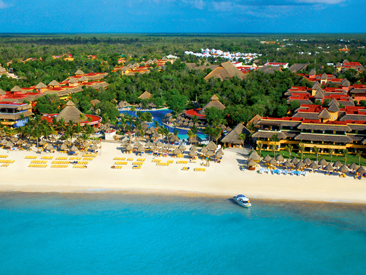 Riviera Maya creates a picture-perfect paradise for those seeking the infinite beauty of Mexico's Caribbean. 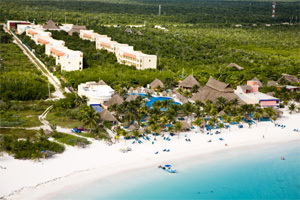 Riviera Maya vacation packages offer quiet, romantic vacation getaways at some of the most popular and enticing resorts in Mexico. A vacation to this alluring coastal paradise also provides an opportunity to gain an appreciation of nature and Mayan history. 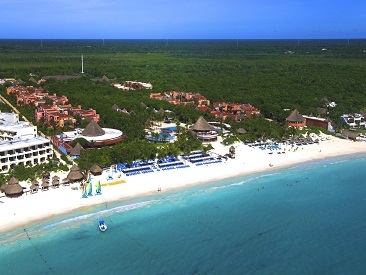 On the idyllic Riviera Maya, you can explore fascinating national parks and tour ancient Mayan ruins. 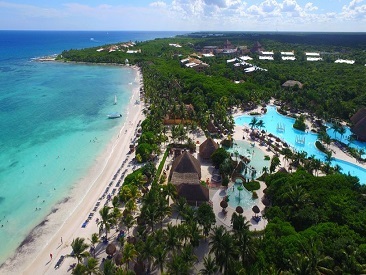 Riviera Maya boasts beautiful beaches bathed by the warm, turquoise-blue waters of the Caribbean Sea which offers a wealth of nautical activities to engage the interest of beach-goers. 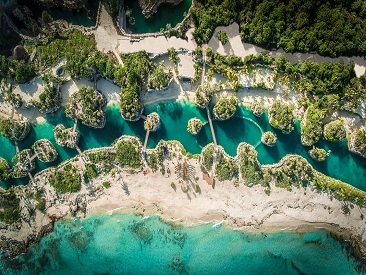 There are also subterranean rivers and ponds to swim, dive and explore in, and beautiful lakes and cenotes to discover. 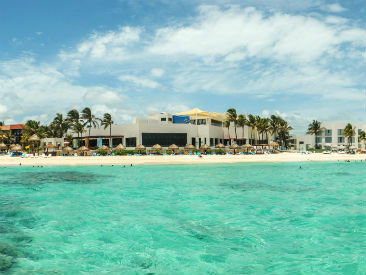 You can also catch a ride on the ferry to Cozumel, easily accessible from trendy Playa del Carmen with its eclectic mix of shops, galleries, cafes and clubs. 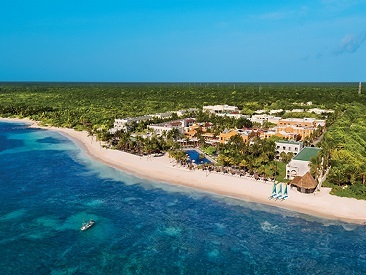 Just about an hour drive from the airport, Riviera Maya hotels promise a laid-back vacation experience at some of the finest resorts in the Caribbean, including secluded world-class boutique resorts and lively, socially interactive all-inclusive mega-resorts. 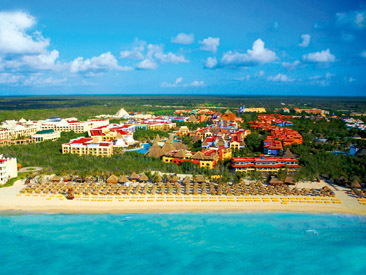 A Riviera Maya vacation package offers something for everyone! 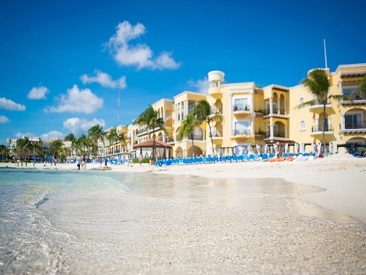 Please Note: Some municipalities in the Riviera Maya have instituted environmental taxes that will be charged to the traveler at hotel check-in. These taxes are generally only around $1 - $1.50 USD per room per night and do not apply to all hotels. If you are being charged this fee it is your responsibility to pay for this since it is not part of your prepaid vacation package. Stay at One, Play at Four! 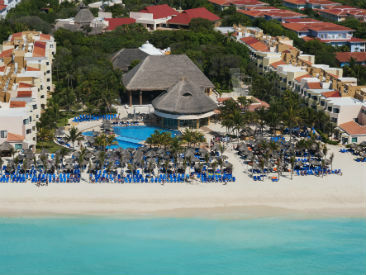 Exclusive adults only (18+) resort located in expansive beachfront all-inclusive resort complex with numerous pools, a spacious spa and fitness area, an array of non-motorized water sports and activities and entertainment galore! Part of Vacation Express' RELAX Collection! 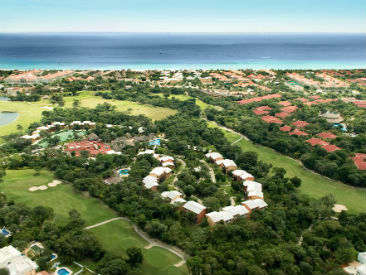 Located in the exclusive Playacar community near Playa del Carmen, within two miles of the beach. This affordable, family-friendly hotel is surrounded by a golf course and lush gardens. Guests will enjoy two relaxing pools, daily recreation and live evening performances. 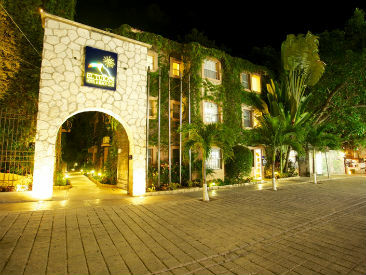 Beachfront hotel located just a short walk from Playa del Carmen. 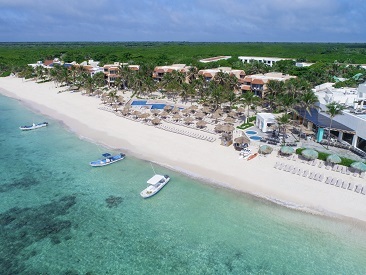 Singles, couples and families with children will find plenty of fun at this casual, yet active hotel offering excellent service, non-motorized water sports, and easy access to nearby Mayan Riviera sites. 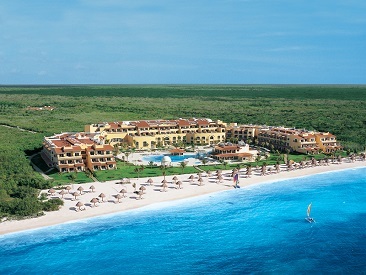 The Mexican Caribbean architecture defines this charming resort. The property has a great location in the upscale Playacar resort area, and is within walking distance to Playa del Carmen. 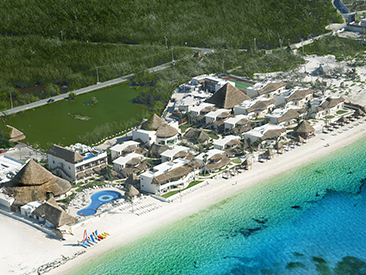 The Reef Playacar features 196 garden view rooms, dispersed among 18 villas, which are woven together but railed paths. Lush gardens provide a tropical canopy, offering a cool shaded jungle-like privacy to the three-story clusters. Each cluster houses up to 12 rooms. Please note this property is not wheel chair accessible. Room assignments on the first floor are not guaranteed. 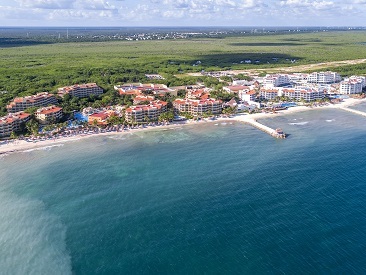 Located on a calm bay in Puerto Aventuras, the all-inclusive Catalonia Riviera Maya and Yucatan Beach offers laid-back fun for couples, singles and families with children. 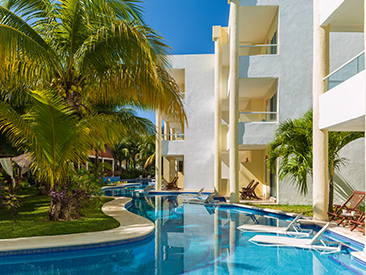 Located on the beautiful beaches of Playa del Carmen, The Reef 28 offers guests a boutique resort experience without lacking in all-inclusive luxury. 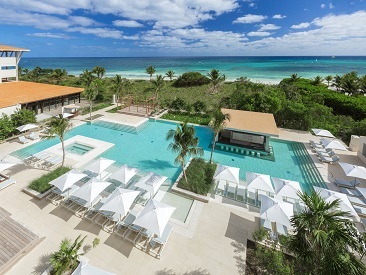 This adults-only resort offers premier services and amenities, including a full-service spa and access to a state-of-the-art fitness center. 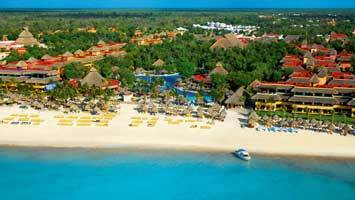 Catalonia Playa Maroma is located in Playa Maroma, one of the world’s most beautiful beaches. 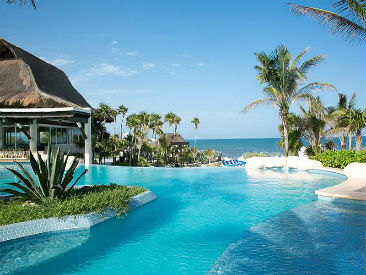 Take in the authentic Mexican decoration, featuring vibrant colors and palapa roofs, surrounded by the native jungle. The Mayan World has a lot to offer its visitors, including exciting activities and many sites of historical and cultural interest while in an area of outstanding natural beauty. Catalonia Playa Maroma is the perfect place for those looking to experience the Mayan culture as well as the breathtaking beaches of the Mexican Caribbean. 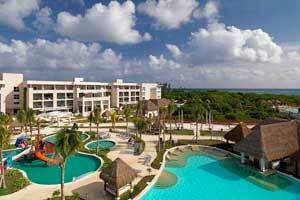 Catalonia Playa Maroma is situated in the Mayan Riviera, on the road Chetumal-Puerto Juárez at only 35 kilometers south of Cancun International Airport and 20 kilometers south of Playa del Carmen. Oasis Tulum Lite is charming, but that is how nature has made this Zen-like resort with a price that is definitely down to earth. The resort is located away from the bright lights and hustle, but the beach is the most extraordinary paradise imaginable, with its amazing shape and coral reef, and spectacular scenery. Bring the family: guests can spend time at the blissful spa while the children check out the super new Kids Club. 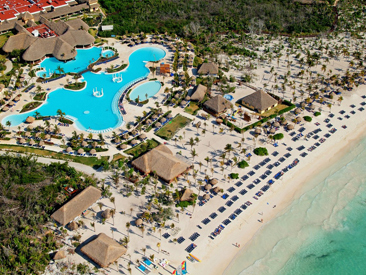 Oasis Tulum Lite is affordable perfection. Stay at One, Play at Three! Part of an expansive beachfront all-inclusive resort complex with spectacular pool areas, a multitude of dining options, a grand spa and fitness area, a mini-club, an array of water sports and daytime activities and entertainment galore! 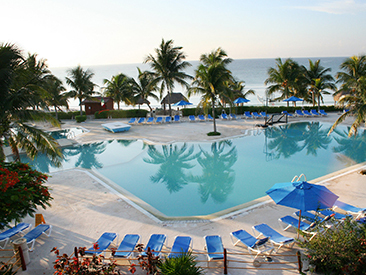 Grand Palladium Kantenah Resort and Spa. Stay at One, Play at Three! 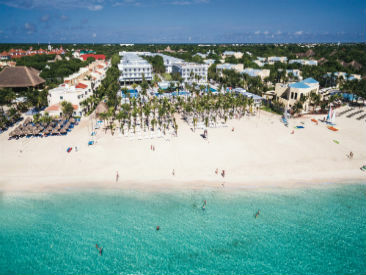 Part of an expansive beachfront all-inclusive resort complex with spectacular pool areas, a multitude of dining options, a grand spa and fitness area, a mini-club, an array of water sports and daytime activities and entertainment galore! 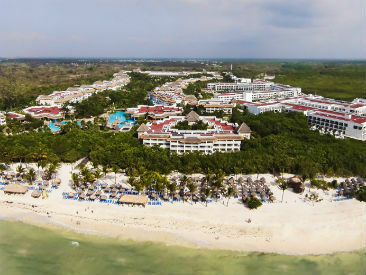 Affordable all-inclusive family-friendly resort located just two miles from Playa del Carmen on a beautiful white sand beach. Enjoy daily activity programs, live nightly entertainment, Renova Spa and water sports galore, including lessons and equipment. 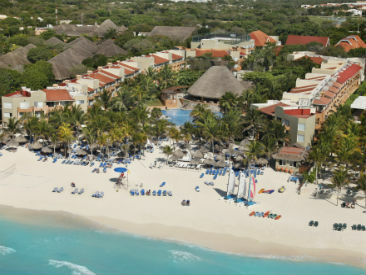 Affordable all-inclusive family-friendly resort located just two miles from Playa del Carmen on a beautiful white sand beach. Enjoy a relaxing atmosphere with unlimited food, snacks and drinks, as well as theme parties, water sports and supervised kids club. 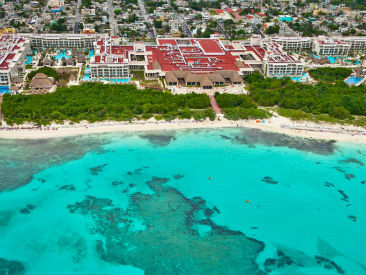 Between Playa del Carmen and Tulum, Akumal Beach Resort offers over a mile of white powdery beach on breathtaking Akumal Bay, with world-class snorkeling and diving and fascinating sea turtle sighteeings in an affordable, friendly, relaxed atmosphere. Grand Oasis Tulum is away from it all but close to perfection with a beach that's incredibly unique, from its exquisite shape to its amazing coral reef. Bring the entire family as children will love the super new Kid's Club. 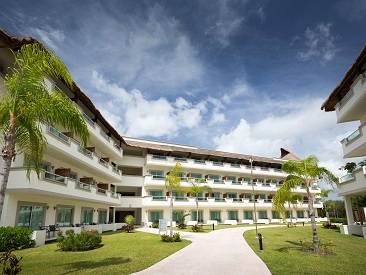 Grand Oasis Tulum maintains an all-natural look while retaining its modern beauty. It's an extraordinary place to stay! Located in the heart of Playa del Carmen, just 45 minutes from the Cancun International Airport, Tukan Hotel & Beach Club is positioned perfectly for guests to enjoy the best of the Mexican Caribbean. With duty-free shopping, restaurants, cafés, lounges, entertainment and a beautiful beach nearby, there’s guaranteed fun for everyone! 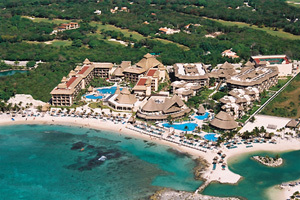 Expansive resort on a beautiful stretch of white-sand beach just minutes from Playa del Carmen. 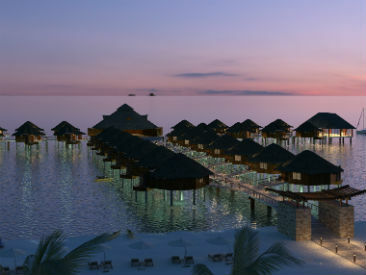 Enjoy numerous dining options and huge, lake-style swimming pools with integrated Jacuzzis and swim-up bars. Amazing environment of swimming pools, tropical forests, and winding waterways. Enjoy 11 restaurants, a disco, entertainment galore, a variety of fun-filled activities for all ages and excellent location adjacent to Xcaret Park. 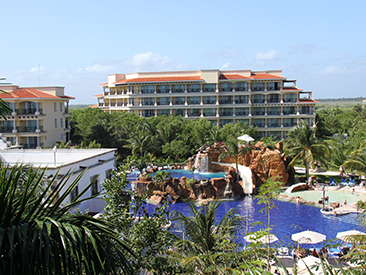 Super active, affordable hotel in expansive Riu Playacar complex, with easy access to beach club just a short stroll away. Two pools, a kids club, lively day and night entertainment and plenty of dining options appeal to all ages. Stay at One, Play at Four! Located in the quiet fishing village of Puerto Morelos, on a beautiful white-sand beach with four outdoor pools, an upscale spa, a variety of dining options and abundant day and nighttime activities. Perfect for everyone! 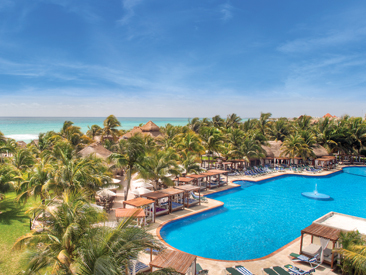 Located just 15 minutes from Playa del Carmen, the active beachfront adults only (18+) all-inclusve Ocean Maya Royale features two pools, non-motorized water sports, tennis, nightly entertainment, a disco and a variety of restaurants and lounges. Snorkeling and scuba instruction are available. 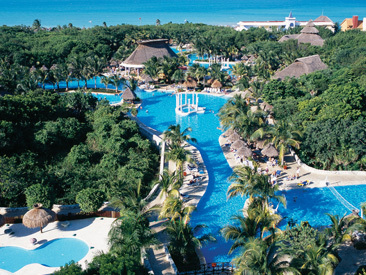 Grand Sirenis Riviera Maya Resort & Spa is a four star, all-inclusive, family friendly, luxury resort in stunning Riviera Maya. Located in the heart of Tulum, this 952-suite resort is a one-of-a-kind getaway that emphasizes fun for the whole family. Featuring three pools, eight restaurants and twelve bars, EcoSirenis Nature Trails and the Kids Club, Grand Sirenis guests can rest in relaxation knowing they’ll have the perfect mixture of tranquility and excitement. 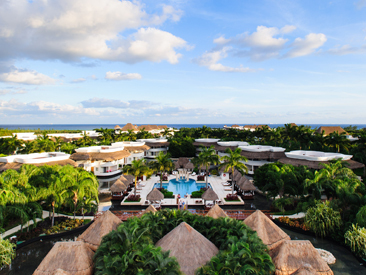 Located in the heart of the Riviera Maya, the all-inclusive, oceanfront Ocean Riviera Paradise resort features exclusive suites, themed restaurants, meeting rooms, a Despacio Spa Centre, a scuba dive center and a wide range of sports and entertainment. Eco-friendly and kid-friendly Royal Elite sections; offers a wildlife and water park, a full-service spa, plenty of dining options and activities galore for all ages. A secluded spot for couples and a family-friendly vacation of a lifetime! Located in the exclusive resort enclave of Playacar along a stretch of sugar-white beach, overlooking the turquoise waters of the Caribbean. 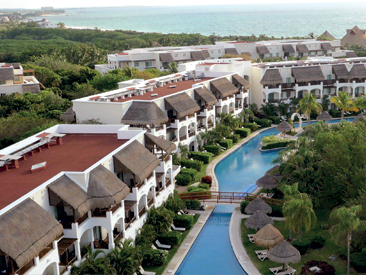 Within strolling distance to Playa del Carmen. 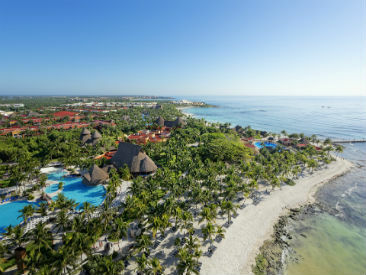 Built with an ecological sensibility, the all-inclusive adults only Catalonia Royal Tulum Resort is surrounded by tropical jungle and the sparkling Caribbean, with rooms and facilities nestled among the lush environment. 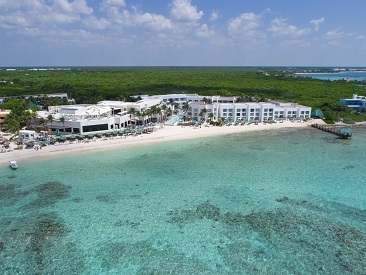 The Platinum Yucatan Princess All Suites & Spa is an adults-only resort, taken to its finest expression; located in front of the crystal clear Caribbean waters, in the heart of the Riviera Maya. Part of Vacation Express' RELAX Program! 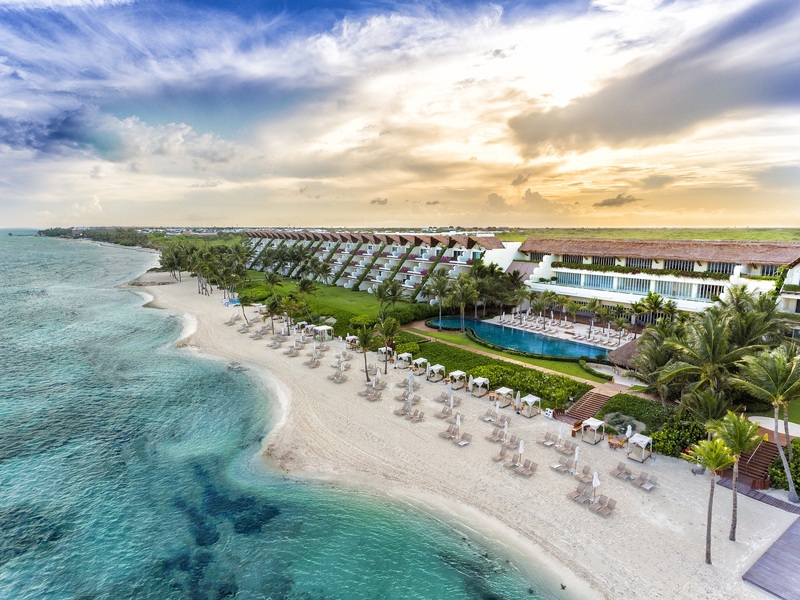 The Sian Ka'an at Grand Tulum is a relaxing, all-inclusive resort on the beautiful beaches of Riviera Maya, complete with all of the upscale amenities and the gorgeous location, guests will find unimaginable satisfaction and enjoyment in every aspect of their vacations. 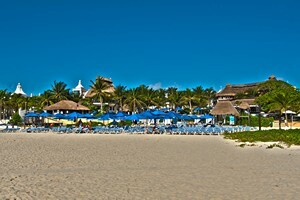 Ideally situated on a magnificent white sandy beach in the gated community of Playacar, the 819-room Sandos Playacar Beach Resort offers families and couples the convenience of an all-inclusive resort, and a perfectly positioned spot for day trips to Mayan ruins, eco-parks, jungle adventures, golf and more. 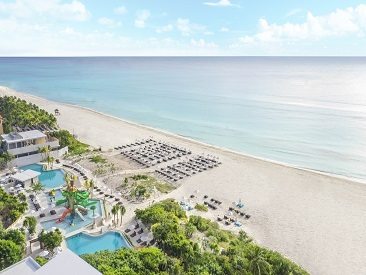 This newly renovated, modern and sleek Caribbean resort now has new restaurants, pools, guest rooms, lobby, wellness center, kids club and free Wi-Fi in public places. 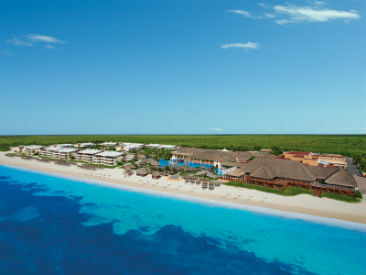 With a prime location on a gorgeous white-sand beach, just a 15 minute walk from the heart of Playa del Carmen, guests can enjoy privileges at sister hotels Riu Yucatan, Riu Tequila and Riu Lupita. 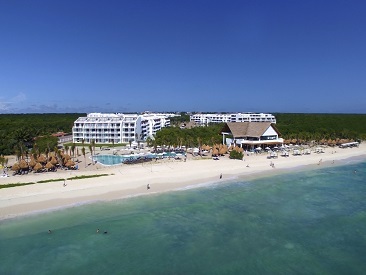 The picturesque all-inclusive Panama Jack Resorts Playa del Carmen is located on a protected stretch of beach near 5th Avenue, right in the heart of Playa del Carmen. Indulge in highly personalized service with special emphasis on families. 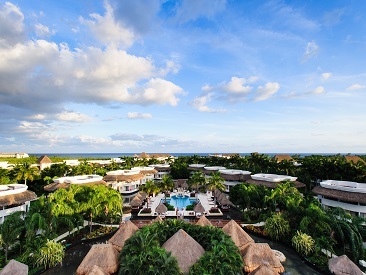 Located adjacent to the adults only Paradisus La Perla resort, this LUXEclusive® beachfront resort has a Mayan ecological feeling surrounded by a lush tropical mangrove preserve and features signature Family Concierge suites. Experience Unlimited-Luxury® at the only resort in the Riviera Maya where you can view the ancient ruins of Tulum from your beach. 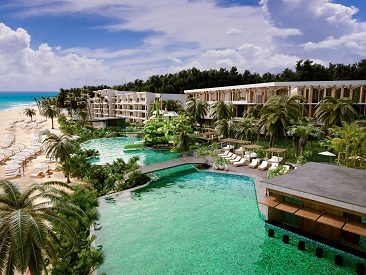 The Riviera Maya, admired for its history and its wondrous sugar-white sands, kaleidoscope of green palm trees, and deep blue sea provide a mesmerizing backdrop for Dreams Tulum Resort & Spa, while Dreams Tulum provides upscale amenities in a relaxed atmosphere! 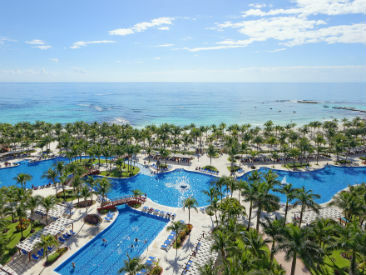 The lively all-inclusive Barceló Maya Beach & Caribe Resort, the largest hotel wing in the expansive Barceló Maya Beach Resort Complex, overlooks a gorgeous stretch of white sand beach and features abundant activities plus a fitness center, a tennis center, mini-golf and a supervised kids club. 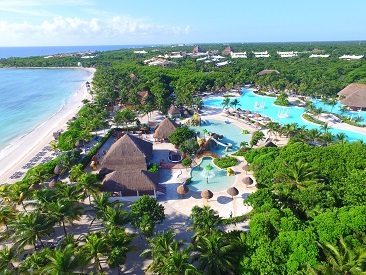 At Barceló Maya Palace, part of the Barceló Maya Beach Resort complex, guests will enjoy engaging activities designed for the entire family plus 2 children's clubs, a spa, fitness center and an incredible array of dining options. Premium Level accommodations are available. 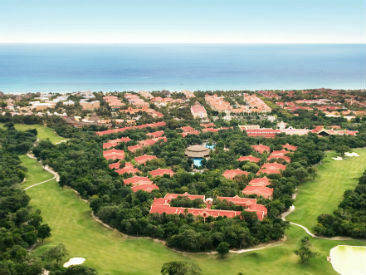 Located 12 miles from Playa del Carmen, Barceló Maya Tropical & Colonial shares 123 acres of rainforest and over a mile of stunning beach with 3 companion resorts. 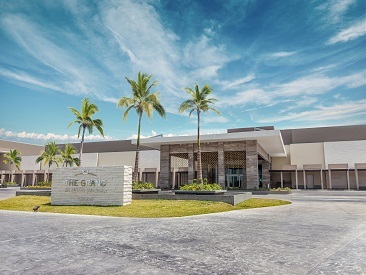 Guests enjoy a variety of dining venues, two pools, one semi-olympic pool, daily activities and watersports, kid's club and access to spa, theater and shopping center. 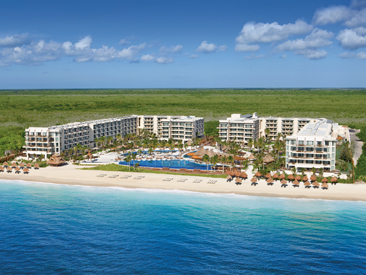 The all-inclusive Unlimited-Luxury® Now Sapphire Riviera Cancun offers a refreshing and fun atmosphere where singles, couples and families can "Live in the Moment" and where play and party are just steps from peace and quiet. Only 30 minutes south of Cancun, it's the perfect escape with all Jr. Suites, world-class spa, Explorer's Kids Club and reef-protected beach. The all-inclusive, beachfront Dreams Riviera Cancun, located between Cancun's southern tip and Playa del Carmen, provides a high level of Unlimited-Luxury® with premium octagonal-shaped suites, 9 dining options, 6 bars, kids club, a lavish full-service spa and activities galore for couples, friends and families. This striking resort is located in the exclusive Playacar area, just five minutes from Playa del Carmen, situated on a beautiful coconut palm fringed white sand beach. Offers sophisticated decor, exclusive service and outstanding facilities for all ages. 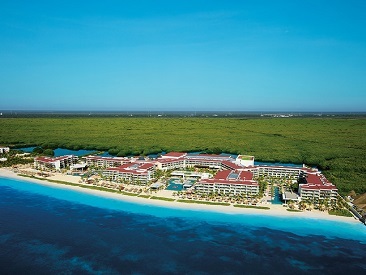 Perched on a dazzling strip of powdery white sand sits the spectacular Royalton Riviera Cancun. Your All-In Luxury® vacation starts the second you arrive, with every aspect of your stay designed to deliver a personalized experience that awakens and enriches the senses. 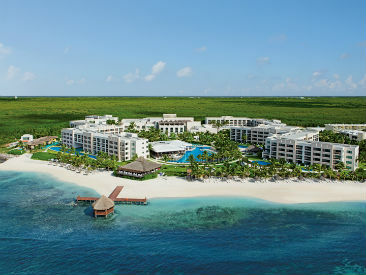 The Hideaway at Royalton Riviera Cancun is an all-inclusive, adults-only (18+) section of the stunning Royalton Riviera Cancun resort in beautiful Riviera Maya. A hotel within a hotel, this 343-room boutique resort is a tranquil oasis that boasts an All-In Luxury® concept and prides itself on being a relaxing, private and kids-free haven within the expansive Royalton Complex where Hideaway guests enjoy full exchange privileges. Featuring an exclusive, adults-only pool, restaurant and bar, reservation-free gourmet cuisine, international and local brand liquors, beers, house wines and a sparkling pool, Hideaway guests are sure to find themselves secluded in relaxation amidst a plethora of activity and action; perfect for adults seeking a mixture of tranquility and fun. Planning a trip for 2018? Add a little excitement to your vacation with Vacation Express’ Paradisus Roulette! 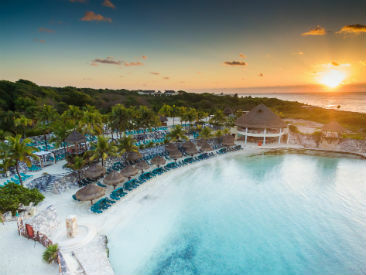 Guests looking for some mystery will be thrilled to learn that they can book a trip and one week before they’re set to leave they’ll receive all the information on their Riviera Maya vacation. As this great deal may land you in either the family friendly La ESMERALDA or the adults-only LA PERLA, this deal is available to travelers 18 years or older. 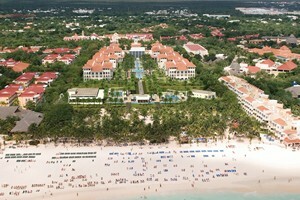 By booking the Paradisus Roulette deal you understand you are not guaranteed accomodations at an adults-only property. A superior adults only luxury resort located on a beautiful bay in the Riviera Maya, combining a prestigious Caribbean setting with world-class facilities, including Royal Service suites and the luxurious Yhi Spa, all in a relaxed atmosphere. 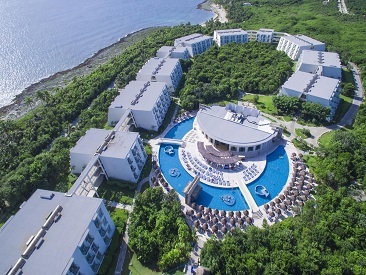 VENTUS at Marina El Cid Spa & Beach Resort is the latest addition to the El Cid resort brand, located on the coast between Cancun and Playa del Carmen. As a newer resort, VENTUS is at the forefront of luxury and elegance standards, and the beautiful location is just the beginning of everything this resort has in store for guests. All 290 Luxury Suites have private balconies, a minibar stocked with water, soft drinks and beer, 24-hour room service and organic bathroom amenities. 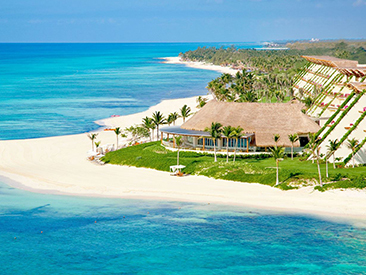 Kore Tulum Retreat & Spa Resort is an all-inclusive, adults-only, oceanfront resort located on Riviera Maya's scenic coastline. Created with your complete relaxation in mind, this resort provides the calm that every vacation deserves. Part of Vacation Express’ RELAX Program! This beautiful resort is located in the exclusive Playacar area, just 5 minutes from Playa del Carmen, situated on a beautiful beach, with exceptional amenities and personal service. Enjoy exchange privileges with five other exciting RIU complex properties! This Unlimited-Luxury® adults only (18+) Mexican hacienda-style resort is nestled on 71 acres of lush landscaped grounds, bordered by a sugar-white beach. Elite 'Preferred Club' concierge-style resort with world-class amenities, where rejuvenation and enrichment meet intimate charm. 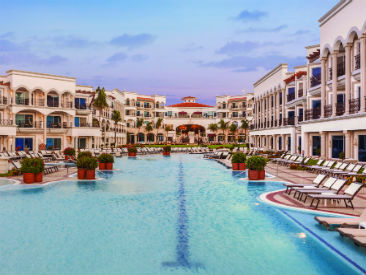 Azul Beach Resort Riviera Cancun by Karisma is a beachfront Gourmet Inclusive®, 435-suite hotel featuring an array of special experiences for families, couples and groups of friends. Enjoy 24-hour room service, a full-service concierge, outstanding cuisine and excellent facilities for kids of all ages. Nickelodeon Experience offered for kids! 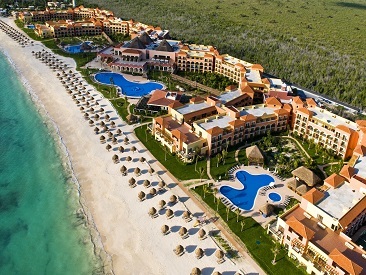 The beachfront Now Jade Riviera Cancun offers a unique Unlimited-Luxury® lifestyle experience for all ages. Guests will find a wide range of top-quality dining options, a sublime spa combining hydrotherapy and signature treatments, three swimming pools, the resort's signature Explorers' Club for Kids and a host of fun activities and entertainment options. Intimate all-suite, adults-only (18+) all-inclusive resort blends luxurious service, outstanding amenities and creative cuisine with a hip yet casually elegant atmosphere. 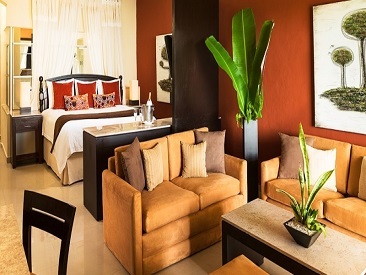 Azul Beach Resort Riviera Maya, by Karisma, a chic family-friendly boutique hotel, features 148 comfortable rooms. Everything is just a short walk away, from the pools and beach to the bars and restaurants. Personalized service is a priority at this Gourmet Inclusive® resort. 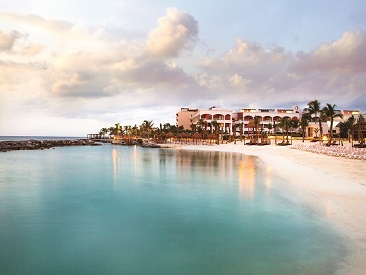 The AAA Four Diamond award-winning all-suite El Dorado Royale Riviera Maya, A Spa Resort by Karisma stretches along more than a mile of secluded beach on the Riviera Maya, and beckons to honeymoon couples and adults (18+) seeking a romantic escape. Luxurious adults only (18+) all-suite, all-inclusive resort features a spectacular expanse of beach, a world-class spa and fitness center, eight restaurants, ten bars, six pools, five outdoor Jacuzzi and spacious accommodations. The exclusive adults only (18+) beachfront Valentin Imperial Riviera Maya offers the best in luxury all-suite, all-inclusive amenities and recreational facilities. Couples and singles will enjoy the finest in Mexican service and hospitality. 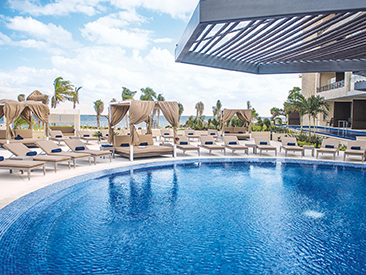 This luxurious adults only (18+) all-inclusive resort offers guests an outstanding beachfront location in the heart of Playa del Carmen and features a spectacular pool area, world-class SPA and the extraordinary accommodations. Immerse yourself in Unlimited-Luxury® where everything is included for adults 18 and over. Elegantly appointed suites with 24-hour concierge and room service. Multiple gourmet restaurants and lounges serving premium beverages. Endless day and evening activities. 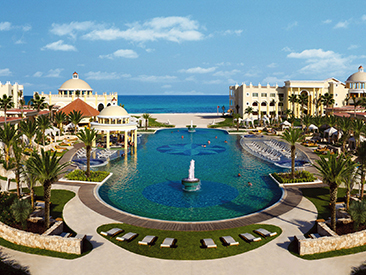 Generations Riviera Maya, by Karisma is Mexico's premier all Suite, all Butler, all Gourmet beachfront resort where couples, wedding parties and families savor a Gourmet Inclusive® experience, a vacation that fosters togetherness. 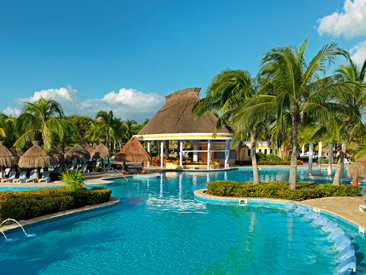 This 150 suite resort is located next to El Dorado Royale & El Dorado Casitas Royale. 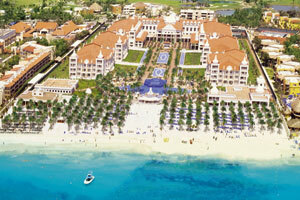 The spectacular AAA Four-Diamond award-winning Moon Palace Cancun is located on Cancun's tranquil south shore. This family-friendly mega-resort offers enough activities and diversions to keep everyone happy 24/7 including golf course, world-class spa and more! 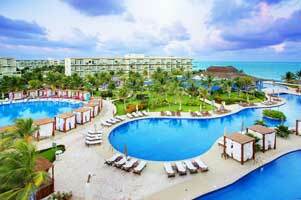 The brand new Grand at Moon Palace Cancun is located on the peaceful south shore of Cancun. This family-friendly resort offers enough activities and diversions to keep everyone happy 24/7 including a golf course, world-class spa and more! 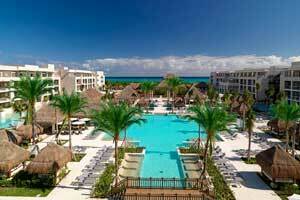 El Dorado Maroma Riviera Maya, A Spa Resort by Karisma is small in size, big on amenities and service. 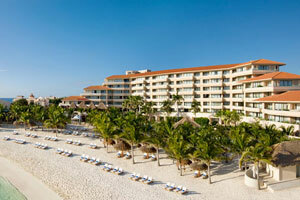 This all-inclusive boutique-style luxury resort offers a spectacular setting on Maroma Beach for guests 16 and older. All guestrooms are beachfront and feature 24-hour room service, modern amenities and personalized services. Experience true Maya adventures at Hotel Xcaret Mexico in Riviera Maya. With the All-Fun Inclusive® program, guests receive unlimited access to nearby parks and deluxe tours to Xenote and Xichen. 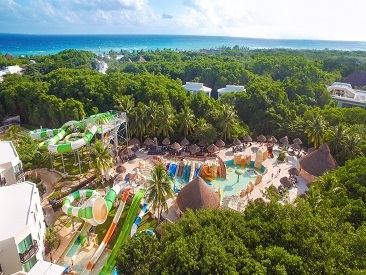 Complete with a kids and teens club, rainforest trails and beautiful, white sand beaches, Hotel Xcaret Mexico offers endless fun for all ages. Hotel Marina El Cid Spa & Beach Resort boasts 500 rooms near some of the best destinations and attractions in Riviera Maya and Cancún. Travel back in time at the ruins of Tulum. Immerse yourself in the breathtaking beauty of a rainforest. Enjoy amazing snorkeling, diving, horseback riding and other diversions. Your choices are endless, which means that no two vacations will ever be the same. 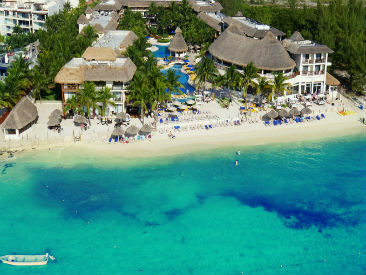 This luxurious all-adult (18+), all-suites resort elevates all-inclusive to an entirely new level. 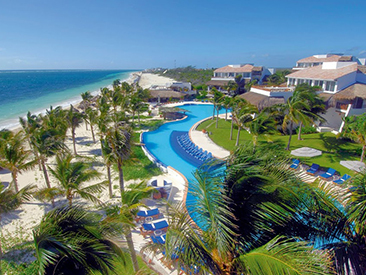 Located on one of the most beautiful and pristine white sand beaches in Mexico, this is the perfect getaway for couples to immerse themselves in Unlimited-Luxury®. This unique, clothing-optional hideaway for couples (age 21+) is set on an exquisite white sand beach in the Riviera Maya. Couples will enjoy a picture perfect setting for an alternative lifestyle escape. 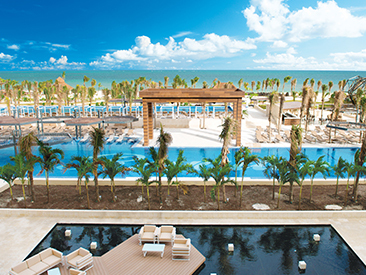 The all-inclusive Hard Rock Hotel Riviera Maya, a luxury family resort on the south end of the adults only Hard Rock Hotel Riviera Maya - Heaven, features 489 well-appointed rooms and activities and amenities geared toward kids and teens. 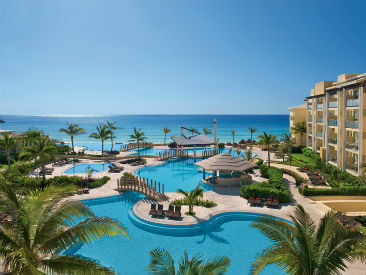 Enjoy valuable extras with $1,800 Resort Credit promotion! 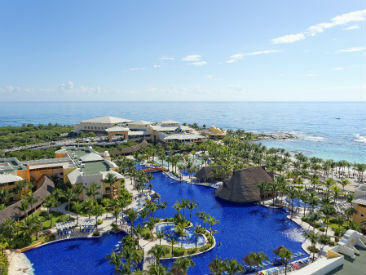 The luxurious Adults Only (18+) Hard Rock Hotel Riviera Maya - Heaven is designed around an incredible world-class spa which invites you to indulge in the ultimate pampering vacation experience. Enjoy valuable extras with $1800 Resort Credit promotion! Perfect for honeymoon couples and adults (age 18+) seeking an elegantly romantic Gourmet Inclusive® escape, the El Dorado Casitas Royale Riviera Maya, A Spa Resort by Karisma is located within the AAA Four Diamond award-winning El Dorado Royale Riviera Maya, A Spa Resort by Karisma, stretching along more than a mile of secluded Riviera Maya beach. 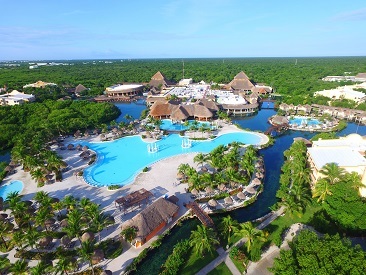 UNICO 20°87° Hotel Riviera Maya is an all-inclusive, adults-only hotel in Riviera Maya, one of the most populated and beautiful destinations in Mexico. With a redefined, all-inclusive plan that offers a spa tub and fully-furnished terrace with every suite and villa, as well as 5 star accommodations, it is truly a new vision of luxury. This vibrant international outpost is the newest height of luxury, giving you a one-of-a-kind, all access pass into the local, modern culture of Riviera Maya. 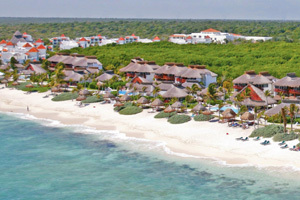 The gorgeous Palmaia Riviera Maya is stretched along over 2,000 ft. of pristine beach in the exclusive area of Playacar. 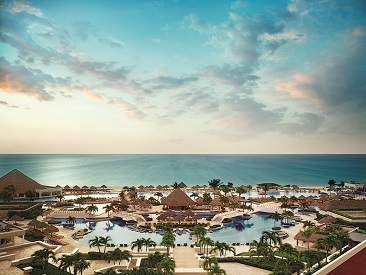 The resort consists of 314 oceanfront rooms divided over 7 4-story buildings. Palmaia Riviera Maya guests enjoy a private hotel entrance, private lobby check-in and exclusive concierge lounge with Wi-Fi, snacks and music from 7 am – 9 pm. Guests have the option to travel using the exclusive shuttle service or the Bike Share Service. A paradise for couples, Desire Riviera Maya Pearl Resort invites you to come with your partner and discover the ultimate clothing optional retreat in the Mexican Caribbean. 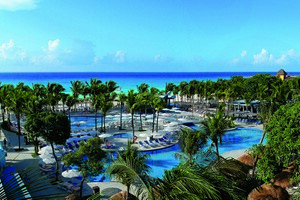 Let all of your senses be seduced by its deluxe all-inclusive program. Desire Pearl sets the perfect scene for the most seductive vacation experience of your life. 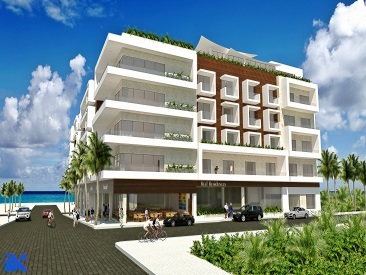 The beachfront, all-inclusive Playacar Palace is within walking distance to Playa del Carmen's famous 5th Avenue. Guests enjoy exchange privileges with other Palace Resorts and valuable extras with Resort Credit promotions! 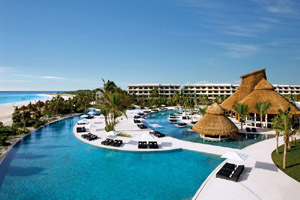 Positioned along a dazzling white-sand beach is the luxurious Secrets Akumal Riviera Maya, an upscale adults-only resort, featuring an array of activities, exceptional entertainment options, delicious dining options, an expansive infinity pool and much more. 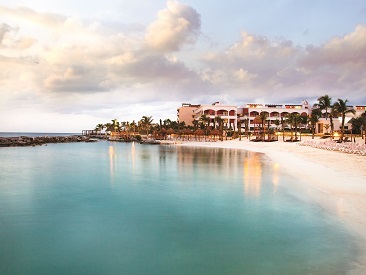 The beauty and splendor of the Caribbean await, in the heart of the Mayan Riviera. 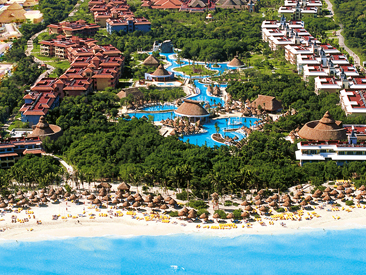 Escape to a lush, all-inclusive paradise that promises Unlimited-Luxury® for families and couples alike. 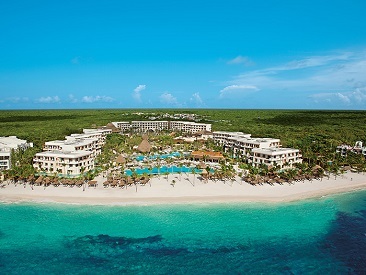 An all-inclusive beachfront resort in the beautiful Riviera Maya. It features elegant suite accommodations, gourmet dining, a deluxe spa, personalized butler concierge services and a cutting edge convention center. An ideal choice for travelers of all kinds. 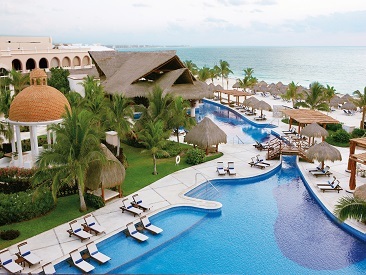 Grand Class at Grand Velas Riviera Maya is an all-inclusive beachfront resort in the beautiful Riviera Maya. It features elegant suite accommodations, gourmet dining, a deluxe spa, personalized butler concierge services and a cutting edge convention center. An ideal choice for travelers of all kinds. 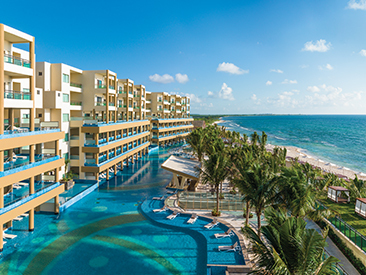 Breathless Riviera Cancun Resort & Spa is a beachfront, adults-only resort in Riviera Maya, one of Mexico’s most popular destinations. With Unlimited Luxury® and endless options for dining and drink, it’s the perfect place for your next vacation. Spend your vacation right on the water with the Palafitos Overwater Bungalows at El Dorado Maroma. 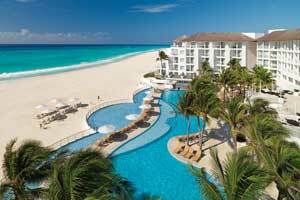 These private suites are located just off beautiful Maroma Beach in Cancun, Mexico and are the pinnacle of luxury. With a full list of added amenities exclusive to guests staying in the Palafitos section, there’s no end to the possibilities for your most relaxing and luxurious vacation yet. 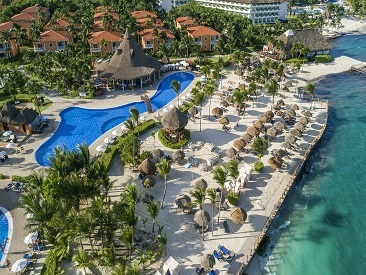 The all-inclusive beachfront Blue Bay Grand Esmeralda features two swimming pools, children's clubs, great restaurants, a world-class spa and fitness center, luxuriously appointed rooms and suites, business meeting rooms and a premium location near Playa del Carmen.